This entry was posted on March 30, 2015 by Posturite. Productivity levels are immediately increased by approximately 10% with the screen at the appropriate position. Computer screens are part and parcel of our everyday lives. We spend hours staring at them. But how much do you know about how to use them to improve productivity and avoid health problems? See if you can pass our screen test below! 4. What is the correct monitor viewing angle position? 10-20 degrees below eye level? At eye level? or 20-30 degrees above eye level? How often are you (or your colleagues) perched on the edge of your chair leaning forward to look at the screen? Hunching your shoulders perching on the edge of your seat could cause damage to your spine if you sit like this for long periods of time, have a look at our DSE learning resources for tips on how to best set up your workstation. This distance should be at least 60 cm, but preferably more than 60 cm. The viewing distance is determined by the character size, whereby the viewing distance should be at least 200 and preferably 150 times the character size (a character size of 4 mm therefore corresponds to a viewing distance of 60 cm). A relatively long viewing distance is less tiring to the eye, because the eye does not have to make such big adjustments. It is easier to read larger characters than small ones. In other words, smaller characters reduce productivity levels. Read our ergonomic workstation set up guide for more tips! There is now a wealth of evidence to show that productivity increases significantly, and error rates decrease when using 2 screens. A lot of people tend to work from three or four programs at once, which is miles easier with more than one screen. Research has shown that computer workers achieve 10-15% improved productivity levels and make 33% fewer mistakes when using two or three computer screens (Research Productivity and Multiscreen Computer Displays – Janet Colvin et al). Very significant if you have a large team of administrators or information processors. 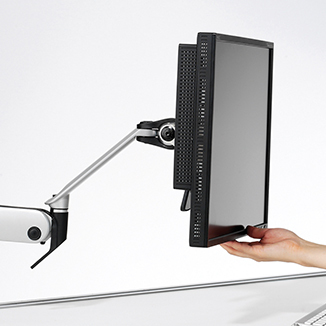 For a perfect dual monitor solution why not try our monitor arms? Viewing angle: The screen should be positioned in an area that is 10-20° below eye level. The eyes are better able to accommodate images and converge at those levels and this helps to reduce eye fatigue. In addition, this monitor position also reduces discomfort and neck complaints, while reducing static burden on the neck muscles. Another important benefit: productivity levels are immediately increased by approximately 10% with the screen at the appropriate position. The positioning of the screen is critical for the laptop user as well. Productivity increases significantly, and you’ll make less errors. A laptop stand is ideal, and a monitor arm with laptop adaptor is even better. Laptop stands undoubtedly have a positive effect on the posture and also increase working comfort.